Hi all you readers of the Catblog! Happy Easter! It’s been a long time between posts, I know, but my weekly Sunday Comics posts which are shared through Yahoo Groups really keeps me busy. 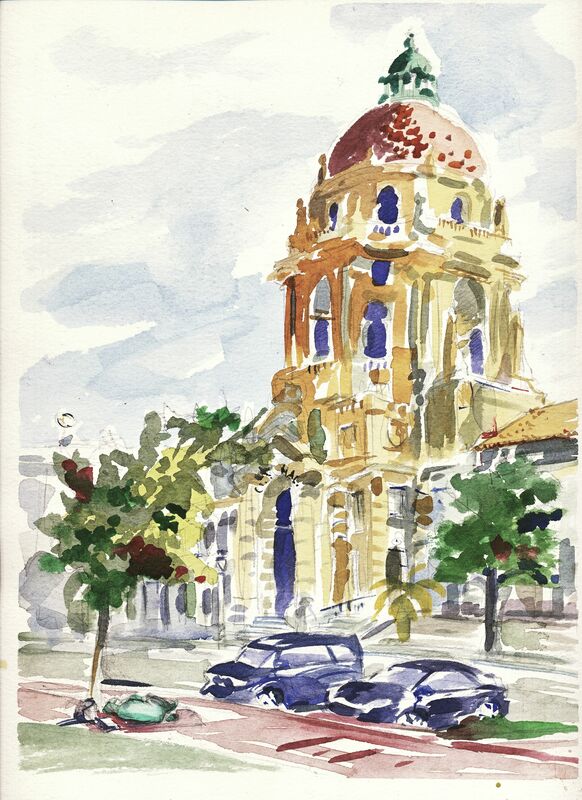 I’m leading off with a 9 X 12 inch watercolor study I did of the Pasadena City Hall a few years ago. It was a hazy, partly cloudy day, so my colors are just as they appeared to me that day, a bit muted. I used reds as shading in the trees, playing compliments against each other. The Pasadena City Hall finished construction in December, 1927, and was influenced by the 16th Century Italian architect, Andrea Palladio. The Lantern on top of the dome, is 206 feet from the ground. In this painting I don’t think I managed to represent the true scale of the building, but I condensed it slightly to fit the page. In Felix, from 5-29 to 6-4-1933, Felix tries to ransom Danny’s clothes from a Tramp by plying him with grub stolen from Danny’s ice box, fished from a stream and waylaid from a restaurant delivery man. The Tramp is finally placated with a pair of Danny’s Dad’s trousers, which unfortunately contain the week’s salary. The Sunday has Felix back in 1933 again, helping out a little bicyclist by siccing an angry goat on to the neighborhood boys who puncture bicycle tires. Check out the Felix jigsaw puzzle and the play money given to the readers as a bonus next to the “Laura” topper! Myrtle is from 2-28 to 3-6-1949 this time. I like the 3-4 daily as Bingo is shooed away from Susie’s bed, Freddie’s chair and his own doghouse. Winding up back on Susie’s bed, Bingo exclaims: “Now we’re ready to start all over!” Also funny is the 3-2, as Freddie strips a stuck sweater over Myrtle’s head and she irons out her mussed-up, ruffled hat. The Sunday page from 3-6-49 is beautifully laid out as Myrtle’s braids are once again clipped off. Dudley Fisher liked to “masculinize” Myrtle every so often, and she looks very much like a boy without her braids. Myrtle figures out how to instantly switch between boy and girl in the second panel. Here’s two weeks of Krazy Dailies, from 6-14 to 6-26-1943. The first week is devoted to “heat” and “hot spots”. 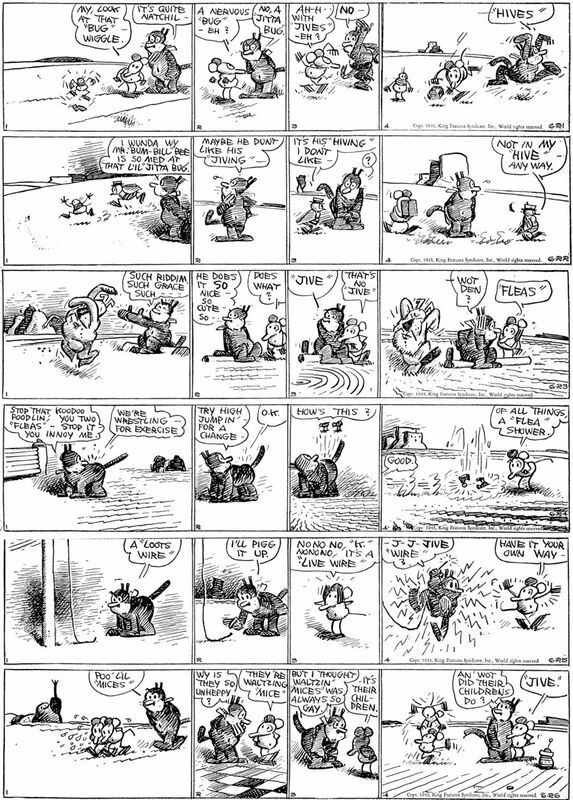 Ignatz pulls a Kat style pun in the 6-18 (Roam-Ants) and Krazy extends the pun a bit further by saying: “From Rome, Eh?” In the 6-16 and 6-19 strips, Garge shows the floorboards of the Coconino “stage”, along with Krazy heating a tea kettle over a “hot spot” in the 6-16. The second week is devoted to the 1940s dancing “Jive” craze. I like the “Jive Wire” joke in the 6-25 more than the other “Jive Jokes”. Garge draws one of his strangest Krazies in the 6-24. He attempts an all fours pose on the Kat as a couple of fleas do some “KooDoo Foodlin” on her back. She almost looks like a Scotty dog. (Garge loved Scotch Terriers, and owned a pair of them.) The approach to the anatomy of the Kat’s front legs radically evolves as she grows shoulders in the change from the first to the second panel. 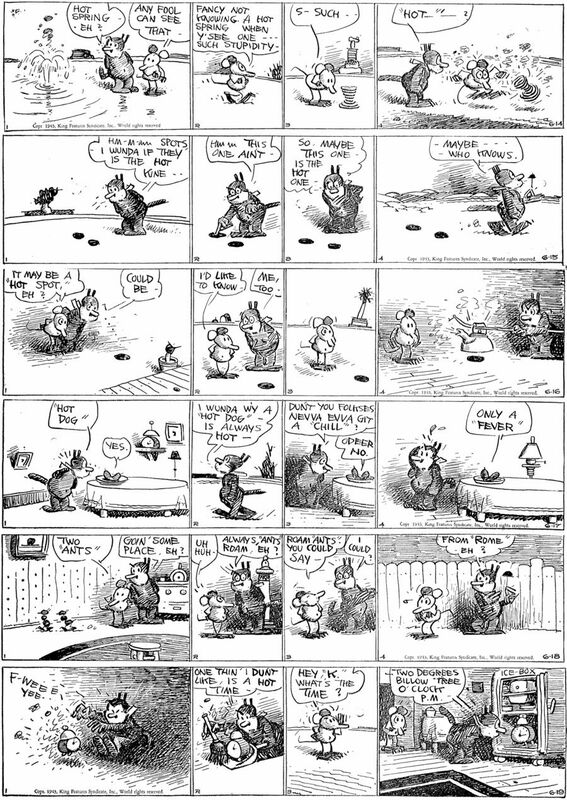 There is good foreshortening in the third panel of the Kat’s front legs, so perhaps Garge was troubled with his arthritis when he drew the first panel. May you all have a wonderful and blessed Easter. Remember, Rabbits can’t lay eggs. Rest in Peace, Fred Crippen, veteran animator and director. And one heck of a drunken golfer! You are currently browsing the Mark Kausler's CatBlog blog archives for March, 2018.